Since the launch of his eponymous mens lifestyle fashion collection in 2000, John Varvatos name has been synonymous with casual modern elegance and uncompromising standards of craftsmanship. Now a favourite of stars Orlando Bloom, Adrian Grenier, Ashton Kutcher and Joaquin Phoenix, his fashion has a vintage feel with a modern edge, refecting his years spent at both Calvin Klein and Polo Ralph Lauren. 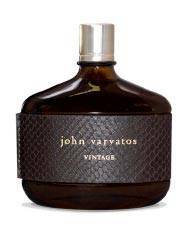 Johns second fragrance, John Varvatos Vintage, is a new interpretation of the original John Varvatos, with intensified and embellished signature notes. VINTAGE reaches back to move forward. Sensuous, mysterious, the sexiest mens fragrance of the season. Rooted in the signature fragrance, yet distinctly unique with a rugged authenticity and enduring appeal.A sensual and masculine composition of the aromatic chypre family. Vintage contains an assertive spicecombined with a warm leather background. Top notes Opening with crisp West Indian tamarind tree leaves and smooth madjool date fruit, the introduction is captivating. The top note is finished off with a wealth of bracing Mediterranean herbs to add a toning masculine accent. Middle notes, the heart of the fragrance presents an unexpected trio of aromatics. Coriander seed templar brings a balanced blend of spicy and fresh, while clary sage flower hints at a trace of tobacco and sage that develops into a warm, ambery afterthought. Indian ajowan rounds off the middle note with a scent of thyme. Base notes, the lingering scent. The background exposes the fragrance at its most sensuous core, mixing rich wood textures with balsamic, ambery and leather undertones. Eaglewood provides a sense of mystery, followed by auramber, an inviting note radiating with power and lift. A sleek black leather nuance weaves throughout, deepening the accord and accenting the mystery while the finale is marked with soft sandalwood, sensuous balsams and a touch of vanilla.